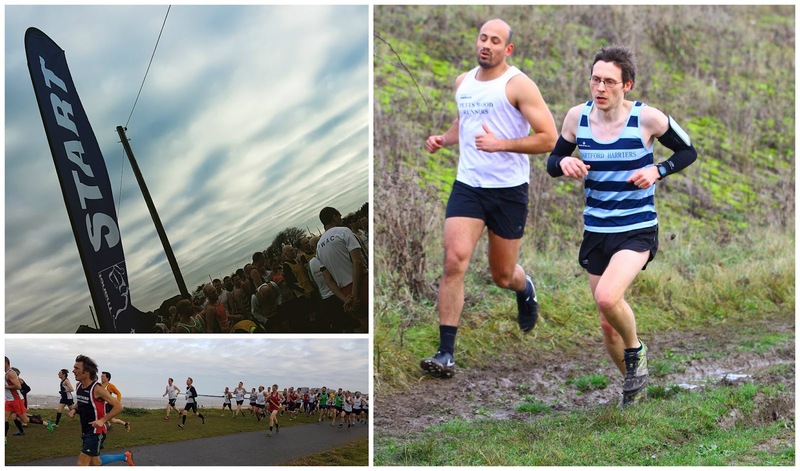 The fourth match of the 2016/17 Kent Fitness League cross country season took place at Minnis Bay, which is in Birchington on the north coast of Kent. I first ran this race in 2015, so if you want to know a bit of history and have a more detailed course description please have a look at my Minnis Bay 2015 blog post. At my only previous race here, I did pretty well - finishing in 36th position in a time of 42.16. I suspected that I wouldn't be able to match that performance from 2015, but I made a note of that finish time so I could compare at the end of the race. The race started fairly well for me, with no holdups. The very splashy opening four kilometres from 2015 were almost bone dry due to the lack of rain this winter, so I was pretty happy to be running a cross country race with dry feet for a change. One thing I had forgotten was how monotonous this course is. There's a lot of running-in-a-straight-line to do and there's nothing more than open scrubland to look at. I suffered from a stitch a few kilometres in and it made it difficult for me to sustain my pace, so I had to relinquish a few positions during the 3rd and 4th kilometres as my pace slowed. By the start of the second half of the race, it had subsided enough for me to push a little harder, so I did and I was slowly gaining on the group of runners in front of me. However, when I stepped in, my foot kept going down deeper and deeper into the abyss. It was soon joined by the other foot and I had to claw my way out of it while it clung onto my lactate-filled, achy legs. Fortunately my shoes managed to stay attached to my feet. The next few ditches were also muddy, but I got through with creating any more incidents. After the drama in the ditches, my rhythm had been broken and I found it really hard to get going again. A few runners caught up with me, but I just couldn't switch my legs back on, and so inevitably they passed me. Inside the last kilometre, the legs felt like they had partially woken up, but a large amount of the end of the race is run on single-file paths. The places where I felt strong enough to pass, I just couldn't squeeze through and by the time the course opened up, it was for the final 100 metre finish. I'm not a great sprint finisher so I just pushed a little harder, but didn't break into an all-out sprint. I crossed the line and worked my way around to the end of the funnel where I was issued with raffle ticket number 75. This is the highest finishing position I have had this season, so I was pretty pleased to be within the top 100 again. My time was around a minute slower than my 2015 time, and while disappointed to not be a little closer, I wasn't surprised. Something that did surprise me was that when I looked at the official results, it turns out that I actually scored for my club, which is something I was not expecting and it hadn't even crossed my mind. It looks like some of the good Harriers runners were either injured or hadn't turned up. Had I realised this beforehand, I might have been a little more aggressive in the closing stages of the race. Last time at Minnis Bay, I didn't take any technology out on the course with me. However, this time around I wanted to gather the course data, so I ran with my phone in its case on my arm. I fortunately managed to keep it out of the mud and I now have the course GPS data to share with you all - Kent Fitness League: Minnis Bay 2017. My club, Dartford Harriers won the combined (male and female) team competition despite coming second in both of the individual male and female competitions. This makes it four straight wins out of four races this season - the other three so far have been Knole Park, Swanley Park and Oxleas Wood. The remaining fixtures of the season are Nurstead Court, Blean Woods and Fowlmead.